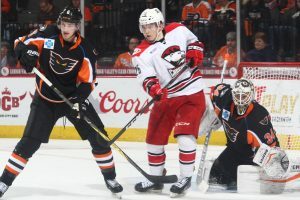 Lehigh Valley, Pa. – Greg Carey scored with just 1:43 left in regulation Friday evening to break a 1-1 deadlock as the Lehigh Valley Phantoms edged the Charlotte Checkers 2-1 in front of 5,549 fans inside PPL Center in Game 1 of the Atlantic Division Finals. With the win, the Phantoms claimed a 1-0 lead in the best-of-seven series. 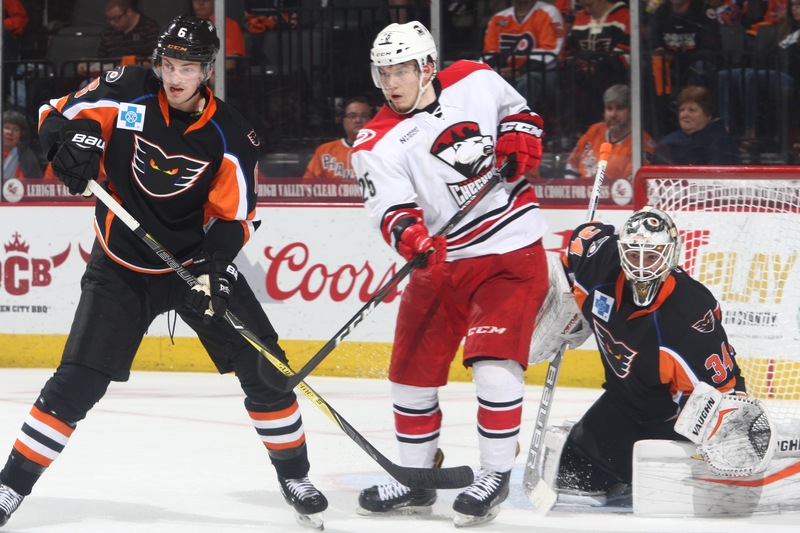 The Phantoms and Checkers will continue their Atlantic Division Finals showdown in short order with Game 2 set for Saturday at PPL Center. Tickets are still available for Saturday’s highly-anticipated postseason showdown and can be purchased HERE. The victory was Lehigh Valley’s 10th straight home triumph as Lehigh Valley has now posted a sensational 20-1-2 mark at PPL Center since January 13. Over the team’s last 10 home outings, which includes three straight home postseason victories, Lehigh Valley has outscored its opposition 34-13. Alex Krushelnyski (1st) tallied the Phantoms’ other conversion in front of goaltender Alex Lyon who was outstanding once again between the pipes for Lehigh Valley as he turned aside 29 of Charlotte’s 30 total shots on goal. Lyon’s effort in goal included a perfect middle frame in which he answered each of the Checkers’ 15 bids in the second stanza as he improved to 3-1 this postseason. 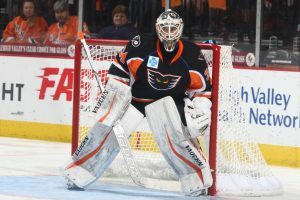 In five games since returning to Lehigh Valley following a stint with the Philadelphia Flyers, Lyon has gone 4-1 while posting a 2.06 goals-against average coupled with a 0.941 save percentage. 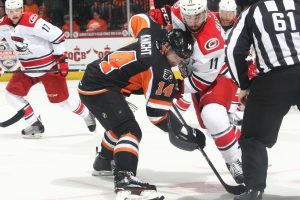 Lyon outdueled Charlotte’s Alex Nedeljkovic who recorded 30 saves on Lehigh Valley’s 32 total shots while Valentin Zykov (2nd) netted the Checkers’ lone conversion on the evening. The Phantom’s power play was 1-for-5 in the victory and has now converted five man-advantage markers across five games in the 2018 Calder Cup Playoffs (5-for-19). Meanwhile, Charlotte’s power play went 0-for-2 Friday evening and is now just 1-for-17 in four games this postseason. Friday’s game marked the return of forward Mikhail Vorobyev to Lehigh Valley’s lineup after the first-year center missed the previous six games due to injury. The 21-year-old forward notched nine goals, 20 assists and 29 total points across 58 regular season games before making his professional postseason debut on Friday. Charlotte opened the scoring with just under five minutes left in the first period when a series of blocked shots by Lehigh Valley produced a loose puck atop the goal crease that found the stick of Zykov who promptly stashed home his second goal of the playoffs. Lucas Wallmark and Andrew Miller assisted on the even-strength strike netted 15:27 into the opening frame. The Phantoms leveled the contest just over six minutes into the second period when Colin McDonald’s jam play at the front of the Checkers’ net produced a rebound on the left wing leading to Krushelnyski’s first conversion of the postseason. McDonald collected the primary assist on the five-on-five tally while Cole Bardreau garnered the secondary helper on Krushelnyski’s goal buried 6:17 into the middle stanza. The Phantoms then landed the game’s final strike with less than two minutes remaining in regulation when, with Zykov in the penalty box for tripping, Carey hammered home his third goal of the postseason. Corban Knight and Chris Conner assisted on the power play strike netted 18:17 into the final frame.